This Automotive Key Cabinet is a must for all automotive businesses and car dealerships. This automotive key cabinet is specially designed with the automotive industry in mind. It starts with heavy duty 18 gauge all steel construction and locking front panel. The key hooks are designed with today's large key fobs in mind as the rows have extra spacing between hooks and more room between the rows. Also the rows are staggered to allow more room for the keys to hang in between the row below. 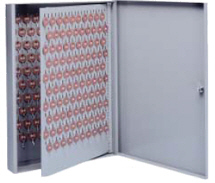 This wall mount cabinet has a capacity of 60, 120, 180 and 240 sets of keys. Durable baked on enamel finish in light grey will go with any office decor. Never loose those expensive keys and key fobs again and save time from hunting for lost keys with this automotive key cabinet. Mounts to wall from the inside of the box. Mounting screws not included. Two keys included with cabinet. Furnished with numbered labels and shields. NOTE: PLEASE ALLOW APPROX. 14 DAYS FOR DELIVERY OF THIS CABINET! What you will get when you order your box. 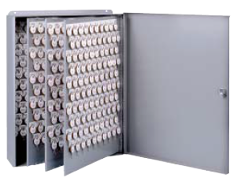 When ordering the 60 hook cabinet you will get one 60 hook back panel mounted to the back wall of the cabinet, this may be expandable at a later date to 180 hooks by adding one 120 hook swinging panel. When ordering the 120 hook cabinet you get one swinging panel mounted in the box, this may be expandable at a later date to 180 hooks by adding one 60 hook fixed panel to the back wall of the cabinet. When ordering the 180 hook cabinet you get one 60 hook back panel mounted to the back wall of the cabinet and one 120 hook swinging panel installed in the cabinet. This cabinet is NOT expandable to 240 hooks. When ordering the 240 hook cabinet you get one 60 hook panel mounted to the back wall of the cabinet, one 120 hook swinging panel and one 60 hook fixed panel mounted on the front cabinet door. This is a factory installation only for this cabinet because the 60 hook front door panel must be installed at the factory. Expandable panels may be installed at a later date depending on which model you choose. Call for details on expanding cabinets at a later date.